KINSHASA, 23 August 2007 (IRIN) - Instability in the Rusthuru region of North Kivu, which included an attack on UN peacekeepers, caused the temporary displacement of more than 10,000 people, officials said. UN Mission in the Democratic Republic of Congo (MONUC) military spokesman Major Gabriel De Brosses said trouble flared up when the North Kivu brigades were pelted by rocks during an incident in Bunagana village on 20 August. "These people, some of whom were armed, wanted to stop the blue helmets from getting into the village," he said. The peacekeepers, he said, had been trying to gather information on the assault of two Congolese intelligence agents (of the Agence nationale des renseignements) the weekend before. They returned to the village the next day with national police and were attacked again. 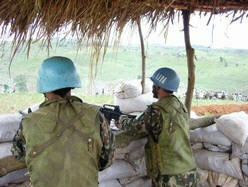 He said three Indian peacekeepers and an officer from the Congolese police were wounded during the fighting. Local residents said the incident, in which the UN fired into the air, involved militias organised by General Nkunda. Nkunda, a former general in the Congolese Army, led a revolt in 2004 claiming to be protecting the minority Banyamulenge Tutsi population from attacks carried out by the rest of the population. His forces have continued to attack government positions in North Kivu. Despite joint counter attacks by the Congolese Army and UN peacekeepers that have frequently forced Nkunda's forces to withdraw, sporadic clashes have led to displacement within the DRC and into Uganda. Three days before the Rusthuru attacks, police and Congolese army ammunition reserves were looted in the village of Nyakakoma, about 30km from Bunagana. "Around 50 individuals wearing civilian clothes stole approximately 20 AK-47s," said De Brosses. Meanwhile, 57 soldiers who were former members of Nkunda's rebel group have deserted the regular army, said De Brosses. Other recent attacks on relief agencies include the armed robbery of a vehicle from the Norwegian NGO Refugee Council (NRC) at a military roadblock in Kalengera village, 10km from the centre of Rutshuru. The UN Refugee Agency said more than 10,000 Congolese crossed over to Uganda's southwestern district of Kisoro seeking refugee on 21 August as instability in the region escalated. "A joint team from the office of the [Ugandan] prime minister, the World Food Programme and UNHCR left Mbarara [in southwest Uganda] on 22 August to verify the reports," Robertta Russo, the UNHCR spokeswoman in Kampala said. Local leaders in the area and news reports said many of the Congolese had already returned to the DRC.